Start a large soup pot on medium-high heat. Melt the butter and olive oil, then add the sliced onions. To caramelize the onions, sauté for three to four minutes, or until they have softened. Turn the heat down to medium-low, stirring occasionally. The onions will begin to caramelize and may stick to the bottom of the pan. Using a wooden spoon, scrape the caramelized bits from the bottom of pan and incorporate with rest of the onions. When the onions have sweetened and turned a rich, amber color, add the Marsala and red wine. Cook the wine until reduced, and then add the chicken stock and veal demi-glace. Cook for one to two hours on medium heat, letting the liquid reduce and thicken. Add the 1/4 cup of red verjus, kosher salt and fresh ground pepper, to taste. Cook for another 10 minutes. Taste and add more salt if needed. At our February Cabernet Day, we made this a soup shooter and we opted out of the melted Gruyère toast that is typically found atop French onion soup. If you choose, top off this rich, beautiful soup, by toasting 12 baguette rounds piled with Gruyère cheese in a broiler or toaster oven. In four large soup bowls, evenly ladle the French onion soup and top with three melted cheese rounds. 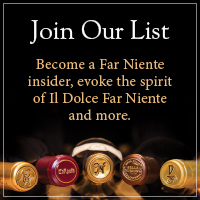 Enjoy with a glass of Far Niente Cabernet Sauvignon!